He's a former President's grandson, but Vice Presidential candidate Mar Roxas is also an Araneta. 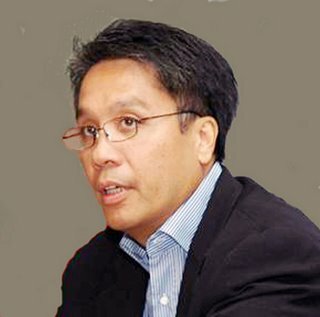 Mar Roxas was born Manuel A. Roxas II, a namesake of his grandfather, former President Manuel Roxas. We all know this obvious connection because of the name, but I think the majority of us do not know that Mar Roxas is an Araneta. We have explored Gibo Teodoro's family connections with the Cojuangcos, and of course, we now know that Noynoy Aquino is the only son of Sen. Ninoy Aquino and Pres. Cory Cojuangco-Aquino, now let's take a look at VP Candidate Mar Roxas' family tree. Manuel "Mar" Araneta Roxas II is the son of Gerardo Manuel "Gerry" Roxas and Judy A. Roxas. His siblings are Maria Lourdes "Ria" Roxas (now married to August Ojeda) and the late Cong. Gerardo "Dinggoy" Roxas, Jr.
Mar's father, Gerry Roxas, himself a former Senator and Presidentiable, is in turn, the son of former Pres. Manuel Roxas. "Judy A. Roxas" as how she is usually introduced, on the other hand, is an Araneta, heir to the Araneta Coliseum, among other huge businesses. She is the daughter of J. Amado Araneta and Ester Araneta, founders and owners of the Araneta group. The Araneta Clan, of course, if one of the biggest and most powerful in the Philippines. Here's a chart to make it easier to understand. So, what do you think of the front runners of the Presidential and Vice Presidential race for 2010 - The Royalty of Philippine politics, the richest Filipinos, and the most influential families - the Roxases, the Cojuangcos, the Aranetas and the Villars - all vying for the most powerful seats in the land. Are they sincere in their proclamations of change, of progress, of integrity? Or at they just out to protect their own assets and businesses? I was thinking of the something else. Since they're already wealthy, we could have a certain assurance that they won't be "money-hungry" and get corrupted by the lure of money. Nice work on the family tree. Magaling ka pala sa dendrology. In short, you have what it takes to be a gardener. lols. Well, I like Mar Roxas to begin with. Noon pa man, he's different from the garden variety type of politicians. Am I saying he's not a traditional politician? Nope, it's not that at all. Wow this one good post bro! Discovering the genealogy of presidentiables and those who running for the top posts! never thought that you have this rare talent of digging up the archives for people to know of the family trees of politicians. Sabi sa isang movie (i dont remember which) - "What do men with power want? ... More power." Hehhe. But that's an over generalization. I agree more with the second one. But resilience to corruption also takes into play - when their zillions are put at risk, will they put the interests of the country before theirs? Hehe! Typos are welcome here mam jena! Although I do remember an anonymous commenter here saying this blog doesn't allow grammatical mistakes. Huh? *DONT_KNOW* May auto reject. Hahahaha! Have to read up more on Mar Roxas' contributions in the Senate before I broadcast any opinions. Hehe. Hi, I am not sure from which official record did you get Mar's registered name, but his official documents show Manuel A. Roxas II. And yes, while the Aranetas STILL own the "Araneta Center," they are not as rich as we thought. Several Araneta members have lost properties to foreclosure. On top of the foreclosed Araneta properties in Ortigas and in Forbes Park, they just recently lost a 2.5 hectare of land, almost amounting to half a billion pesos, in Alabang. I happen to personally know this. Ahh, hindi "Jr." kundi "II". I saw several mentions of either one but just went with "Jr." because I know people know him mostly as just "Mar Roxas" and that I went with "Jr." as well with Gibo Teodoro. But if you insist, yan napalitan ko na. Thanks for the correction! Hahaha. Uy, I didn't say they're poor ha. I just said they lost some properties to foreclosure. There is a big difference. And yes, they're the "I lost half a billion but I am still rich" type of family.